High quality 20m 2x phono to 2x phono stereo audio cable. Scart to Component Cable 3m High quality 3m scart to component cable, scart to component video. Features cast metal scart plug and phono plugs. Gold plated contacts for perfect picture transfer. RGB colour coded phono plugs. Please note the scart must be plugged into a component video compatible scart (YUV / YPbPr), please see note below. 20m XLR Cable, balanced microphone cable 3 pin XLR plug to XLR socket 20m long. 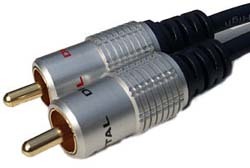 3-pin XLR lead for balanced audio applications. Ideal for microphone connections. Features flexible, two core screened cable with pure copper conductors.